I’m on either my third or fourth copy of Waking the Moon, I can’t remember which. I first read it eleven years ago, loaned it to everyone I thought might be remotely interested, sometimes didn’t get it back, and never felt quite right when I didn’t have it on my shelf. This is one of my Desert Island Books. Sweeney has more on her plate than hangovers and term papers, however. Angelica turns out to be the chosen avatar of a long-forgotten goddess, and the college is controlled by the Benandanti, an ancient secret society dedicated to suppressing the worship of the goddess. Eighteen years later, Sweeney has settled into an ordinary life. But her college ghosts come back to haunt her, as old friends come out of the woodwork and Angelica prepares for her final denouement with the Benandanti. Sweeney is suddenly back in the mysterious, perilous world she briefly glimpsed as a teenager. One of the best touches of Elizabeth Hand’s book is that she doesn’t take sides. Patriarchy and matriarchy are both shown as flawed, and both the Benandanti and the devotees of the Goddess have blood on their hands. Even when Sweeney makes a fateful choice at the end, she makes it for personal reasons and not because she agrees with either faction. 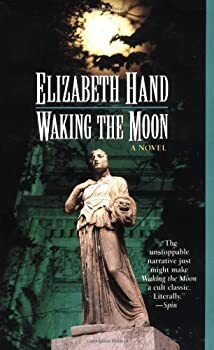 Waking the Moon was the book that got me investigating Goddess mythology all those years ago, and it’s also a fever-dream of a story, with a sympathetic heroine and unique prose. Elizabeth Hand has a writing style that is sensual, vivid, and more than a little bit psychedelic. I used to identify strongly with Sweeney, whose self-doubt leads her to regard her glamorous friends with something close to worship. Over the years, as I’ve grown older and more comfortable in my skin, I’ve stopped feeling so much like Sweeney. Yet I always find something new in Waking the Moon every time I read it. I didn’t realize, the first time, just how many little references to goddess lore were hidden in the text like Easter (or Eostre) eggs. Hand never wastes a detail when she can use it to enhance the story instead. And when I finally heard Nick Drake’s “Northern Sky,” I felt like I was having a beer with Sweeney during the record heatwave that strikes Washington, D.C. in the novel. Even as I’ve discovered flaws and mistakes, it just feels like part of the journey. One of the nonfiction books I found by way of Waking the Moon was Anne Baring and Jules Cashford’s The Myth of the Goddess, and while reading it, I found that Hand had accidentally read the wrong footnote and misattributed a bit of liturgy. My first reaction was not “oops, Elizabeth Hand messed up,” but “this is COOL!” It was like getting to see the gears and wires behind the book, and it was fun. Waking the Moon — (1994) Publisher: Beginning her first year at the University of the Archangels, Katherine Sweeney Cassidy accidentally discovers the existence of the Benandanti, a clandestine order that has been secretly manipulating the world’s governments and institutions. I love reading and teaching coming-of-age stories, even if the person coming of age is quite a bit older (About a Boy). I’ll check this book out–along with the others you mention at the end of your review. I highly recommend the movie Kicking And Screaming (NOT the movie about soccer) about some guys who graduate from college but can’t quite get themselves to leave the college town. Also, the better known Garden State and Bend It Like Beckham (which IS about soccer!). Other favorite coming of age movies– teenager to college age (some of these I teach): The Graduate, Bodies Rest and Motion, Desert Blue, Rushmore, Ghost World (based on a great comic book), Juno, Amelie, Dazed and Confused, Clueless, Ten Things I Hate About You, Almost Famous, Wonder Boys, and Dead Poets Society. My favorite coming of age movie of all time is A Room With A View. Of course, there’s no debate: the best coming age novel ever written is Emma by Jane Austen. Followed by A Room With A View.